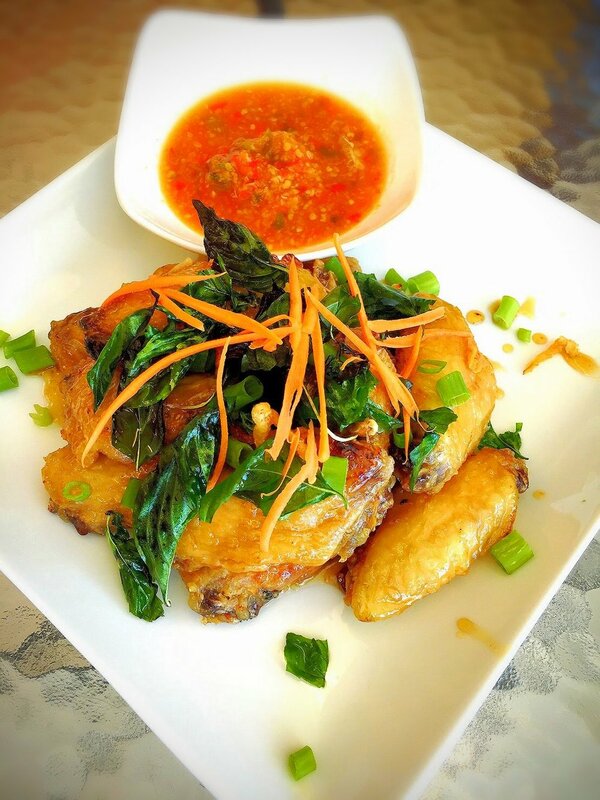 Located in Almaden Valley, Thai Love You is becoming the people's choice for homemade style Thai Food cuisine made from fresh ingredients provided by local farmers. 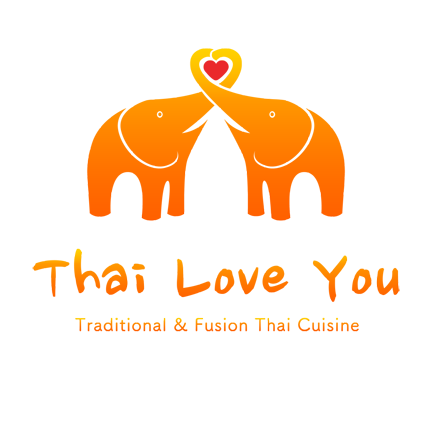 Thai Love You opened on July 14, 2016 and is located at the Meridian Ave and Redmond Ave intersection, inside Almaden Oaks Shopping Plaza in Almaden Valley. Since then, TLY has been serving both quality traditional Thai dishes, while mixing Asian, American, and Mexican styles to create unique dishes for the daring palette. Executive Chef Kunlayakorn "Kat" McCarthy has cultivated her Thai recipes, handed down from her Grandmother and Aunt, for over 4 decades. Every dish she prepares is fresh and unique for every customer's needs and health requirements, including Gluten Free, Vegetarian, and Vegans alike. She takes great pride in everything she does, including designing the interior of the restaurant to how the food is presented. When she has a chance, she loves to interact and talk with her customers making them feel right at home. And that's the essence of Thai Love You. First come first serve basis from 6:30PM to close. Madras curry powder marinated chicken breast, with peanut sauce and cucumber salad. 2 pieces of Thai flat bread served with 3 different curry dipping sauces. Served with spicy garlic chili lime dipping sauce. Green papaya, green beans, shredded carrots, tomato, peanuts, and chili-lime dressing. Thin sliced top sirloin steak, mint, red onion, green onion, cilantro, tomato, shredded carrots, cucumber, and our special chili-lime sauce. Green mango with red onion, green onion, cilantro, cashews, roasted chili, with our chili lime sauce dressing. Spicy sour soup with coconut milk, mushrooms, cabbage, galangal, lemon grass, and lime juice. Spicy and sour soup with mushrooms, lemon grass, lime juice, and cilantro. Rice noodles with Tom Kha broth, broccoli, carrot, baby corn, green onion, and cilantro. Rice noodles with Tom Yum broth, broccoli, carrot, baby corn, green onion, and cilantro. Rice noodles with a mixed Tom Kha and Tom Yum broth, broccoli, carrot, baby corn, green onion, and cilantro. Pan-fried rice noodles with tofu, egg, bean sprouts, green onion. Pan-fried rice noodles mixed with tofu, egg, bean sprouts, green onion, chili flakes, and ground peanuts. Wide rice noodles with egg, cabbage, and broccoli. Wide rice noodles with chili, garlic, bell peppers, and basil. With peanut sauce, broccoli, baby corn, onion, and cilantro. Spaghetti stir fried with garlic, chili, baby corn, green bean, carrot, bell pepper, basil, and peppercorn. with bamboo shoots, green beans, bell pepper, and Thai basil. with jalapeno, bell pepper, zucchini, and Thai basil. with garlic, chili sauce, green beans, and bell pepper. with mango, bell pepper, onion, ginger, cashews, and roasted chili. with mushroom, pineapple, onion, and bell pepper. with bell pepper, sliced carrots, and Thai basil. with bell pepper, onion, sliced carrots, and roasted chili sauce. with carrots, onion, and egg. with jalapeno, bell pepper, onion, Thai basil, and garlic chili stir-fry sauce. with egg, cashews, onion, and carrots. Imported from Thailand – It's Vegan! Winter Squash cooked with coconut red curry, bell pepper, Thai basil, and chicken breast. Prawns simmered in a coconut red curry with white onion, pineapple, bell pepper, jalapeno, and Thai basil. 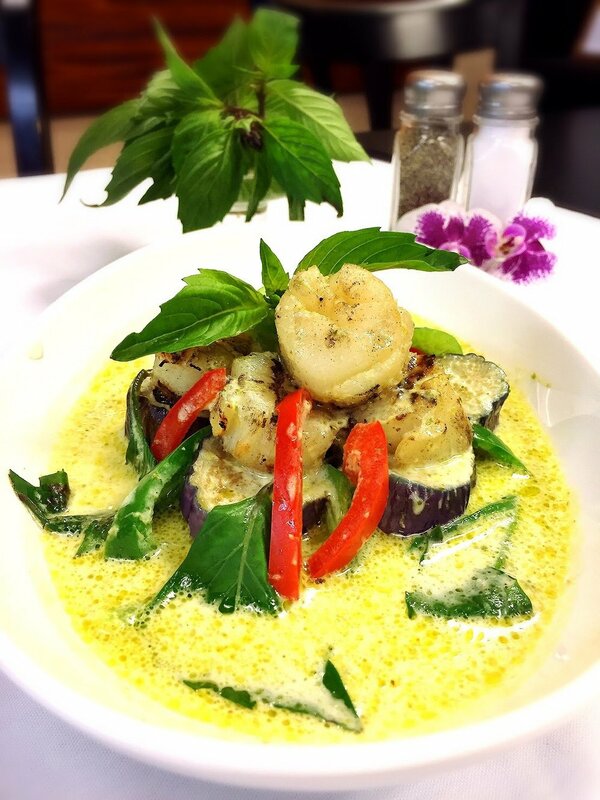 Pacific Cod simmered in a savory green coconut curry with bell peppers, Thai basil, jalapeno, and eggplant. Crab claws stir fried with fresh mango, cashew nuts, bell peppers, jalapenos, sliced carrots, onions, and roasted chili garlic sauce. Prawns, calamari, scallops, and mussels stir fried with peppercorn, bell pepper, jalapenos, onion, Thai Basil and roasted chili. Cod fillets stir fried with sweet corn, peppercorn, green onion, diced carrots, and onion in our garlic black pepper sauce.